The 2016 Mercedes-Benz AMG® GT S coupe celebrates the performance and feel of classic sports cars with a memorable driving characteristics, aerodynamic body styling, and a booming exhaust system. Contemporarily designed with several vintage details, this is one stylish supercar Orangeville, Caledon, Halton Hills, and Georgetown drivers simply must see in person! Stop by Mercedes-Benz Brampton in the Greater Toronto Area to experience the AMG® GT S up close and personal. Crafted by a Master Engine Builder from start to finish, the AMG® 4.0L biturbo V8 that enlivens the AMG® GT S spits out a staggering 503 hp and 479 lb-ft of torque. The V8 engine’s twin turbos are arranged in a “hot inside V” configuration, which transports the compressed charge from either turbo to their respective cylinders in rapid time. With phenomenal power propelling it’s aerodynamic spaceframe, the AMG® GT S zooms from 0 to 97 kph in a mere 3.7 seconds, and reaches top track speeds of nearly 322 kph. All the while, the AMG® Dynamic Performance Exhaust system gives the AMG® GT S a throaty rumble at low speeds, and a deafening roar as it tears down highways and dragstrips. 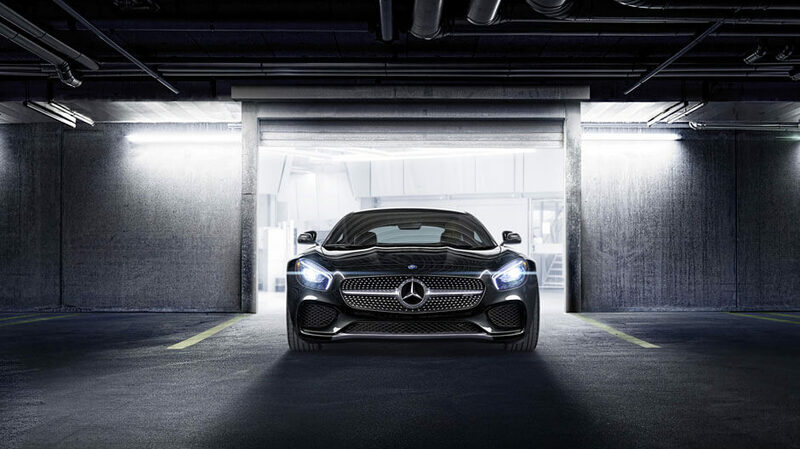 The nimbleness of the Mercedes-Benz AMG® GT S begins with its high-strength yet lightweight spaceframe, which is comprised almost entirely of cast, extruded, and stamped aluminum. Strategic weight distribution is one of many qualities that set this rip-roaring coupe apart. Linked to the AMG® engine is a rear-mounted 7-speed AMG® SPEEDSHIFT® DCT transmission, which includes features like rev-matching, Race Start launch, and four selectable drive modes. The placement of the transmission also contributes to the AMG® GT S coupe’s fantastic 47:53 front and rear weight distribution, which is also made possible by the dry sump lubrication system, carbon-fiber driveshaft, and AMG® Adaptive Suspension system. Racing-derived in virtually every respect, the AMG® GT S is formidably fast, well-balanced, and responsive. Equipped with legendary AMG® Adaptive Suspension with double wishbones at each AMG® twin 5-spoke wheel, this quick-witted coupe adapts to varying driving situations using three AMG® DYNAMIC SELECT® modes: Comfort, Sport, and Sport+. The advanced steering system uses a variable ratio to maximize driver control, as well as speed-sensing hydraulic technology to fine-tune every maneuver. For maximum stopping power, the AMG® High-Performance Braking System relies on rugged front rotors and 391.2-millimetre front discs, connected to red-painted, 6-piston fixed calipers sporting the AMG® logos. 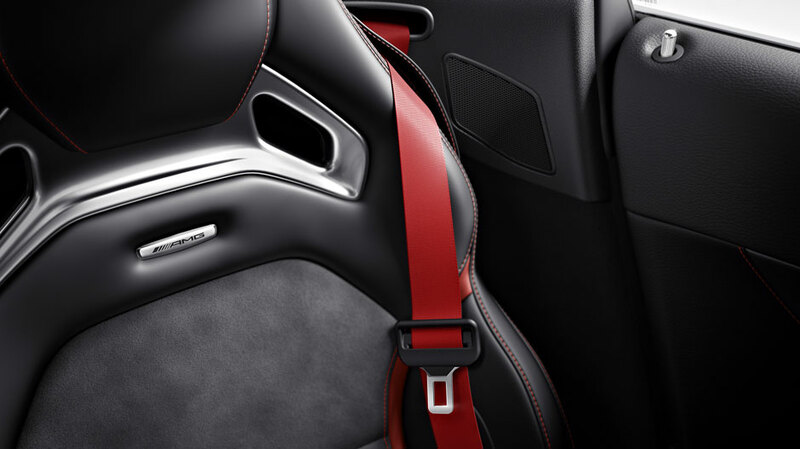 Trimmed with cool Silver Chrome and upholstered with Nappa leather upholstery, the AMG® GT S coupe’s edgy exterior design spills into the cockpit. Behind the heated, power-adjustable front seats, a Silver Chrome crossbar spans the length of the cabin, creating a sleek barrier between the cockpit and surprisingly spacious cargo area. Dual-zone automatic climate control lets Orangeville drivers and their passengers personalize climate settings, while KEYLESS GO® makes it possible to jump in and drive. Affixed to the dash is a 203.2-millimetre COMAND® display with a touchpad controller, which serves as a control medium for the 80GB navigation system, 640-watt Burmester® Surround-Sound system, Bluetooth®* phone and audio, and more. 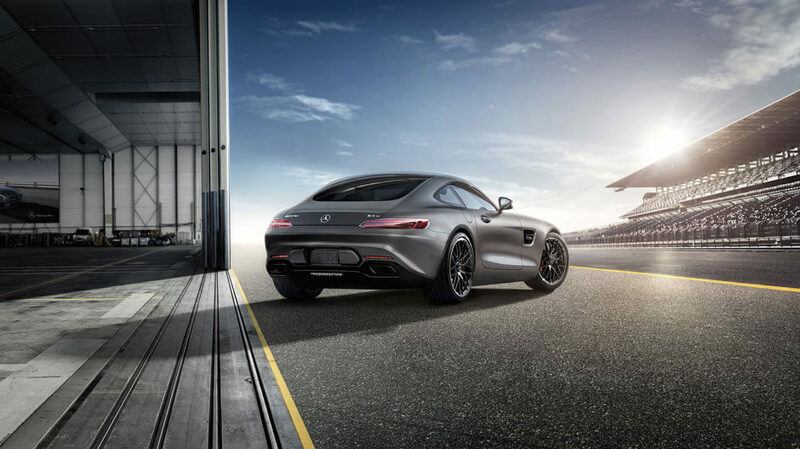 On the road or on the track, the Mercedes-Benz AMG® GT S provides ample protection and driver support, which includes eight airbags, ESP®, Brake Assist, and Mercedes-Benz mbrace®. Full-LED headlamps with Adaptive Highbeam Assist use a camera to detect approaching vehicles, and adjusts the beams accordingly so as not to cause glare. In tight spaces, PARKTRONIC® uses ultrasonic sensors to help you detect obstructions in the front and rear of the vehicle, while the rearview camera makes parallel parking a cinch. Heated, power-folding mirrors offer a clear view in harsh weather, and fold/unfold automatically the moment the AMG® GT S is remote-unlocked/locked. The AMG® GT S Coupe is stimulated by a 4.0L AMG® biturbo V8 engine, which summons 503 hp and 479 lb-ft of torque. Fueled by track-ready engine technology, multiple driving modes, and a performance brake system, this chiseled coupe turns heads and the sharpest of corners. The cockpit welcomes drivers and front passengers with supple Nappa leather, Silver Chrome finishes, a crisp COMAND® display, and a 10-speaker surround-sound system. Experience the AMG® GT S Firsthand! Jump behind the wheel of the 2016 Mercedes-Benz AMG® GT S coupe, and experience AMG®-enhanced performance and trademark luxury. Contact Mercedes-Benz Brampton Monday through Saturday for more information on the new AMG® GT S! For in person assistance, drivers in Halton Hills, Caledon, Georgetown, and Orangeville are welcome to stop by our dealership at 10 Coachworks Crescent in Brampton!